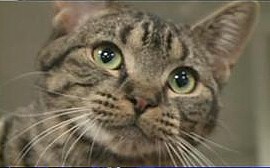 Beautiful green eyed tabby Gilda spent the night at Macy’s in the Walden Galleria mall near Buffalo, NY. She was headed for an adoption center but decided to cruise the mall first. Gilda and her sister were enroute to the SPCA’s Walden Galleria “Cat Army” Adoption Site at the Cheektowaga, NY mall on Thursday when the carrier they were being transported in broke open and the two cats took off in opposite directions. Volunteer Maryann Kiera noted that the runaway cats caused some commotion, with shoppers screaming about animals on the loose. The other cat was quickly caught but Gilda did a bit of browsing before being discovered by shoppers in Macy’s on Friday morning.